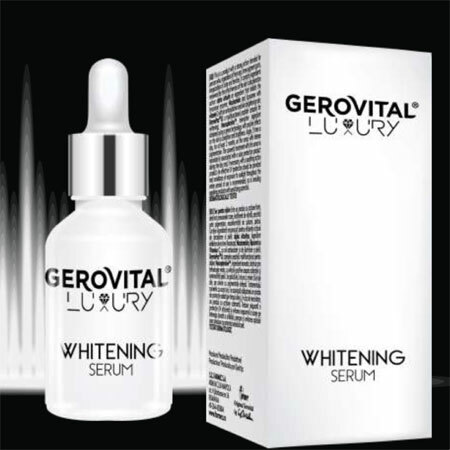 The Gerovital Luxury Whitening Serum is a product with a strong action intended for persons who, regardless of their age, show pigment spots, irregularities of color and freckles. It contains ingredients renowned for the effectiveness of the skin’s discoloration action: Alpha Arbutin an ingredient that inhibits the tyrosinase enzyme. Niacinamide and liposomes with vitamin C with an antioxidative and skin brightening role. DermaPep™UL a multifunctional peptide complex for whitening. Usage: Apply 2 times a day, for at least 2 months, on the areas with intense pigmentation. The cosmetic treatment with this serum is mandatorily associated with a solar protection product during the day and, if necessary, with a soothing action product. An effective UV protection should be provided and avoidance of exposure to sunlight throughout the entire period of use is recommended, as is avoiding applying products with sensitizing potential. Apply 2 times a day, for at least 2 months, on the areas with intense pigmentation. The cosmetic treatment with this serum is mandatorily associated with a solar protection product during the day and, if necessary, with a soothing action product. An effective UV protection should be provided and avoidance of exposure to sunlight throughout the entire period of use is recommended, as is avoiding applying products with sensitizing potential. INGREDIENTS: AQUA, GLYCERIN, PEG-6 CAPRYLIC / CAPRIC GLYCERIDES, DIMETHYL ISOSORBIDE, PENTYLENE GLYCOL, BUTYLENE GLYCOL, alpha ARBUTIN, 3-O-ETHYL ASCORBIC ACID, NIACINAMIDE, PHENOXYETHANOL, SODIUM CITRATE, CITRIC ACID, XANTHAN GUM, PROPANEDIOL, DECYLENE GLYCOL, CAPRYLYL GLYCOL, PARFUM, DISODIUM EDTA, TEPHROSIA PURPUREA SEED EXTRACT, METHYL UNDECENOYL LEUCINATE BENZYL SALICYLATE.